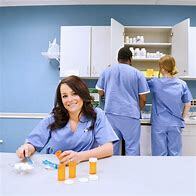 Train to become a licensed pharmacy technician in as little as 5 months! In this 260-hour program, you will learn what it takes to become a successful pharmacy technician. Topics covered include: pharmacology for technicians, pharmacy law & regulations, sterile and non-sterile compounding, quality assurance, & medication safety. Learn what it takes to assist the pharmacist in preparing and mixing prescriptions, maintaining patient records, purchasing and inventory management, billing and reimbursement, and more. Program includes a 120-hour externship where you will receive hands-on training in a pharmacy under the direction of a pharmacist. Upon successful completion of the Pharmacy Technician program, you will be eligible to apply for your California Pharmacy Technician License. **This program fulfills the education requirements of the California Board of Pharmacy (Business and Professions Code Section 4202) for pharmacy technician licensure. **Textbook, lab coat/scrubs, license application fee are not included in tuition.